Since Villa was the only Harley-Davidson rider to carry the #1 plate in the World Championship, I assume this is he. Note the unique ‘hydro-conical’ front brake setup. Aermacchi-designed and manufactured H-D Sprint motors. Though totally different, they also did well in U.S. short-track racing. Neither the public nor, I suspect, Harley dealers really knew what to make of those smaller Harleys. Aermacchi was sold back to the Italians after a few years. Considering that underwhelming Superbike history, you may be surprised to learn that Harley-Davidson actually won several Grand Prix World Championships in the mid-1970s. Americans hardly knew it was even happening; it was an all-Italian effort. Aermacchi was an Italian company that started out in the airplane business, but shifted into motorcycles after WWII. In 1960, Harley-Davidson acquired a 50% interest in the Italian company, because Harley dealers needed smaller entry-level bikes for customers who weren’t ready (or couldn’t afford) a big v-twin. Aermacchi designed and built the 250cc ‘Sprint’ for U.S. sales. Meanwhile, its racing team developed some fast two-stroke twins, like Yamaha’s Grand Prix racers. In 1974, AMF acquired the rest of the shares in Aermacchi. 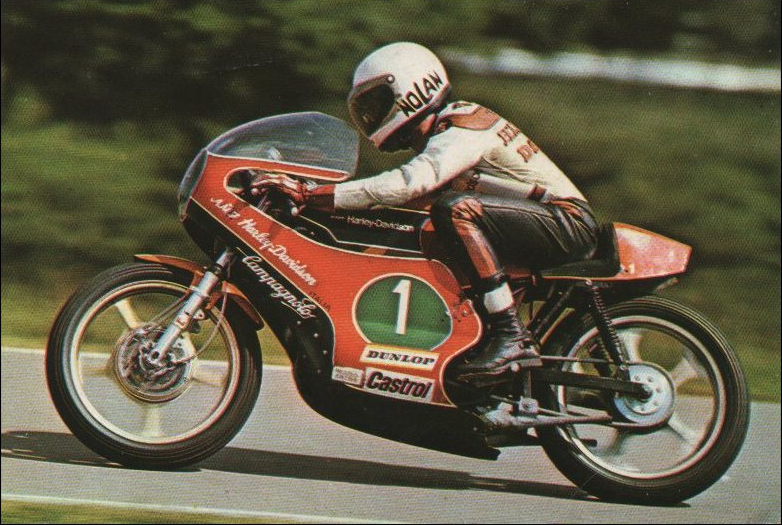 Those Grand Prix racers were rebadged as Harley-Davidsons, and Walter Villa won The Motor Company its only World Championships from 1974-’76. Although Aermacchi was obviously capable of hand-building a few top quality race bikes, the company’s mass-production fell further and further behind Japanese imports in terms of both performance and build quality. AMF sold Aermacchi to the Cagiva Group in 1978.